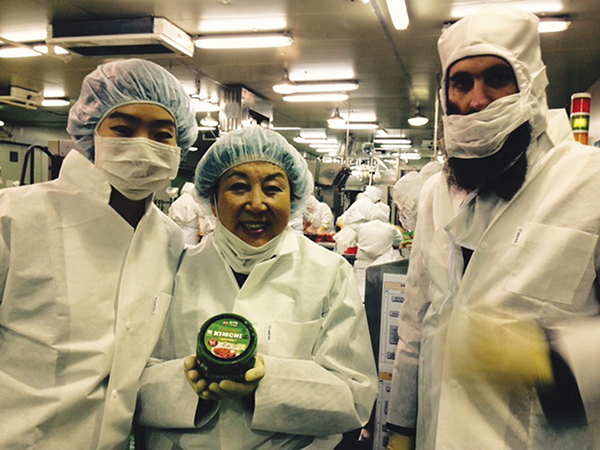 Ziporah Rothkopf, center, at what she says is the only kosher kimchee factory in South Korea. Rabbi Osher Litzman, at right, is the mashgiach and religious leader of the Chabad Jewish community of Korea, headquartered in Seoul. The Hebrew name Ziporah means bird and perfectly suits Ziporah Rothkopf. With homes and offices in Lakewood and Jerusalem, as well as manufacturing facilities in South Korea, she frequently flits between continents. Kimchee, a popular trend as it is considered beneficial for the digestive system, is her flagship product. A pungent, spicy side dish, it is usually made from salted and fermented vegetables, most commonly Napa cabbage and Korean radishes, with a variety of seasonings, including chili powder, scallions, garlic, and ginger. Other products she sells include rice pastas and spices, such as misugaru and meju powder. 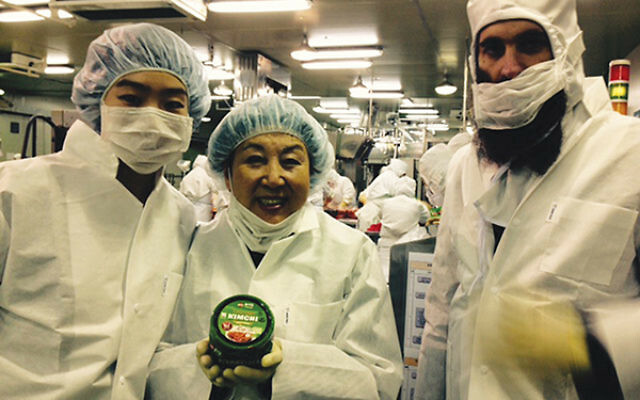 Rothkopf, 70, owes her passion for kimchee to something besides culinary curiosity and a sophisticated palate. She was born in Seoul, and her name wasn’t always Ziporah. She was born Bongja Kim. “My father was one of the first journalists working in Korea after it obtained freedom in 1945,” she told NJJN via email. “He was an intellectual who spoke three languages fluently, and he was involved in politics. By 1970, when she graduated from college with a degree in home economics, Rothkopf had already been married for about a year. She and her husband had a son and daughter who still live in Korea, where she has two grandchildren. Seven years later she divorced, and her father died that same year at 59. She decided she needed to make a change and moved to Las Vegas. “I was very depressed and decided to leave the country and continue my education in the United States,” she said. When visiting friends in New York City she met a young Orthodox man named Moshe. “We hung out with my friends, and then he took me to see the sights,” she remembers. Within a few months, she left Vegas and moved east. She picked up where she left off with Moshe, and major milestones lay ahead. She studied with legendary singer Rabbi Shlomo Carlebach, and converted to Judaism in 1981. She also spent two months at Neve Yerushalayim, a women’s seminary in Israel. She never lost touch with her mother, who recently died, and her siblings in Korea. “I am still very close to everyone, and they were always very supportive,” she said. Now in their 70s, the Rothkopfs maintain an active lifestyle. Moshe is an ophthalmologist and Ziporah is CEO of KoKo Foods. “I first had the idea for the business 36 years ago, and I never let go of the dream,” she said. The company manufactures all its products in Korea and sells them on kosherkorean.com, Amazon, and in local markets such as Seasons, Gourmet Glatt, and Shloimy’s Kosher World.